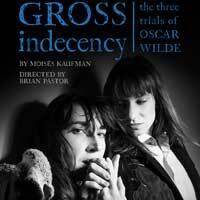 Kaufman's play examines the persecution and prosecution of Wilde for his homosexuality in late 19th Century Britain. In Promethean's production, Kaufman's 1997 meta-theatrical play is structured with the entire cast of nine serving as narrators who go on to assume the roles of the people in this historical story. The genders of Wilde, Douglas and Carson are not changed, but the narrators assuming those roles are women. "...Of course the show is built on a very strong foundation: Kaufman's script is first-rate. His research is sound and exhaustive, his deconstruction of the texts and Victorian era thorough. Yet the show also works as fine, entertaining theater." "...There is quite a bit of gender swapping in Promethean's production. From the namesake character and even Queen Victoria herself, there is no safety in "historical accuracy." And at the end of the day, it doesn't matter. If someone can don Wilde's inscrutable stare and deliver his searing wit in all its power then let them take up the reigns. And if they can't, just hire Bragg." "...There�s a risk in over-relying on primary sources like transcripts and newspaper clippings. Rarely are people as eloquent off the cuff as they are if they can edit themselves. And even then, the pieces rarely fit together neatly. Life is a little too messy for narrative structure without some help from the author. But Oscar Wilde is not an ordinary person nor is his an ordinary case. In the hands of an extraordinary cast, Wilde�s life and wit and society�s cruelty and hypocrisy are brought to vivid life. More directly, I left wanting to go find my copy of A Picture of Dorian Gray." "...Gross Indecency: The Three Trials of Oscar Wilde, running through March 23 at Strawdog Theatre, is an exciting rendering of the courtroom battles that led to a fatal fall from grace for 19th century literary genius Oscar Wilde." "...This 140-minute play, which delves in to characters of history by exploring class and gender through the lens of the morality of the times is anything but tedious. Delightfully modern and sinfully Victorian, it invites us to consider how far we have or have not come in the ensuing 100-plus years as a society, and it does so charmingly, just as Wilde would have wanted it." "...The ensemble is excellent as a whole, with additional standout performances by Kevin Sheehan, Kat Evans, and Brendan Hutt. Pastor makes sure that the various characters they portray, without the aid of any differentiating costuming at all, are distinct and clear. But ultimately this play falls on the two leads, and Bragg and Smith proudly portray these men who are guilty of "the love that dare not speak its name." We are told that Wilde did not see himself as a "homosexual" because, in the first place, that word did not yet exist, and in the second, he would denounce as unfitting any attempt to label the kind of man he was. But he clearly was a man who loved other men-he even acknowledges this in a private meeting with Evans' Harris, a good friend-in an era when that was seen as dangerous and immoral. Bragg and Smith show that love throughout the production in every action and line they deliver."